Scientific computing is the study of how to use computers effectively to solve problems that arise from the mathematical modeling of phenomena in science and engineering. It is based on mathematics, numerical and symbolic/algebraic computations and visualization. 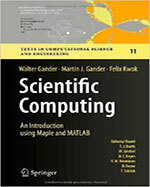 This book serves as an introduction to both the theory and practice of scientific computing, with each chapter presenting the basic algorithms that serve as the workhorses of many scientific codes; it explains both the theory behind these algorithms and how they must be implemented in order to work reliably in finite-precision arithmetic. The book includes many programs written in Maple. Maple is often used to derive numerical algorithms. The theory is developed in such a way that students can learn by themselves as they work through the text. Each chapter contains numerous examples and problems to help readers understand the material “hands-on”.